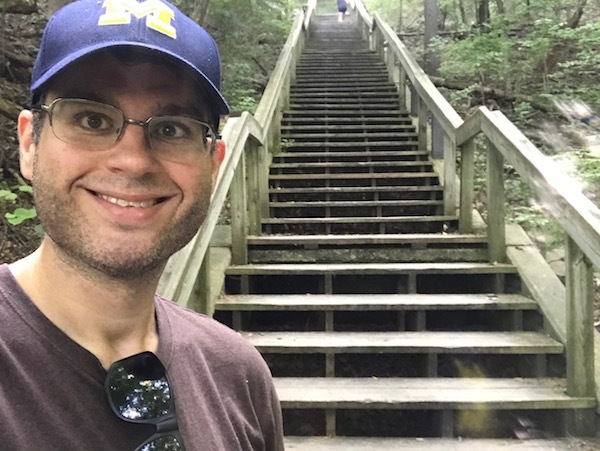 I Just Learned About These Epic Public Stairs, Just Minutes From My Childhood Home | Keep It Up, David! 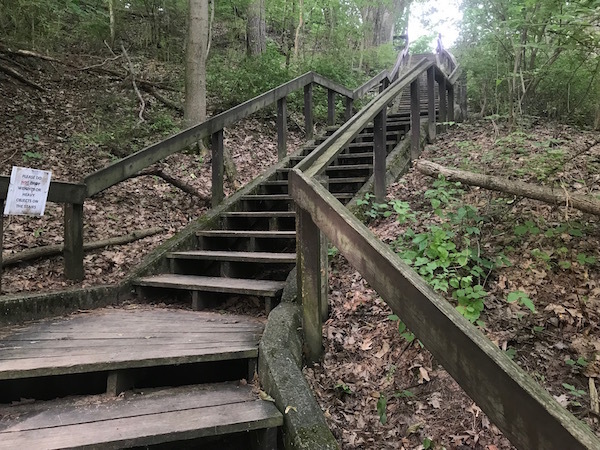 This monster set of stairs is in Bloomer Park, in Rochester Hills, Michigan. 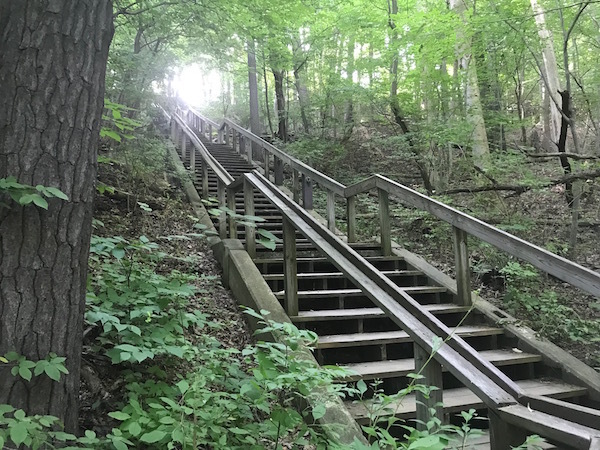 It’s only about 30 minutes from my childhood home, but I had never previously been to the park, and never heard about the stairs. 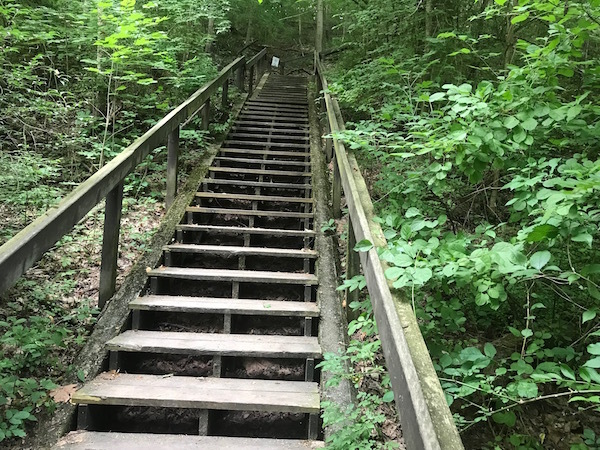 If I wasn’t recovering from some tendonitis in my achilles tendon, I would have devised a workout where I ran loops, up and down the stairways. 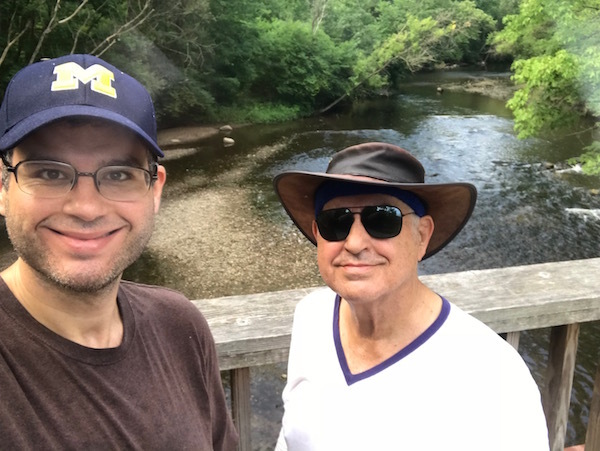 But my ankle wouldn’t have any of that, so my dad and I went on a nice walk that incorporated the stairs, and many of the trails. I considered it recon for the next time I went back! The main Bloomer Park parking lot is at the top, so we started by going down, and then back up, one of the stairways, which had 144 steps. 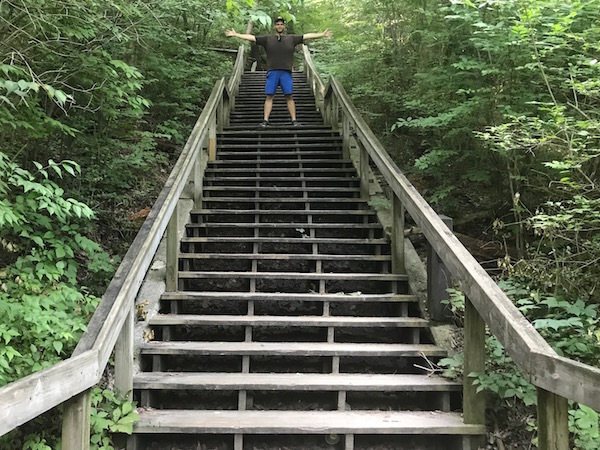 Then we went down the second stairway, and explored some trails, with the intention of climbing the second stairway at the end of the walk. 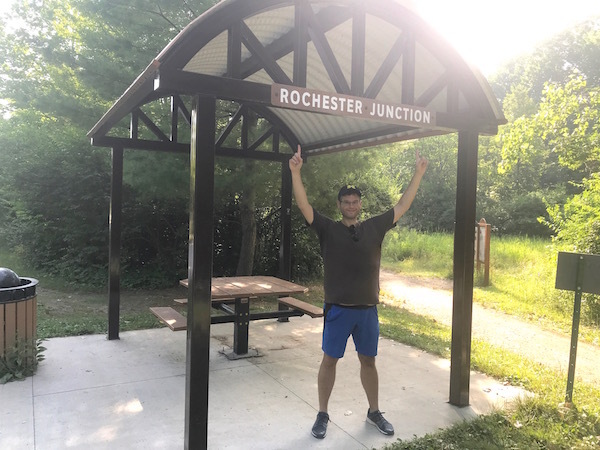 We learned that the point where the two railroads diverged was called “Rochester Junction,” and that spot is memorialized with a picnic shelter. 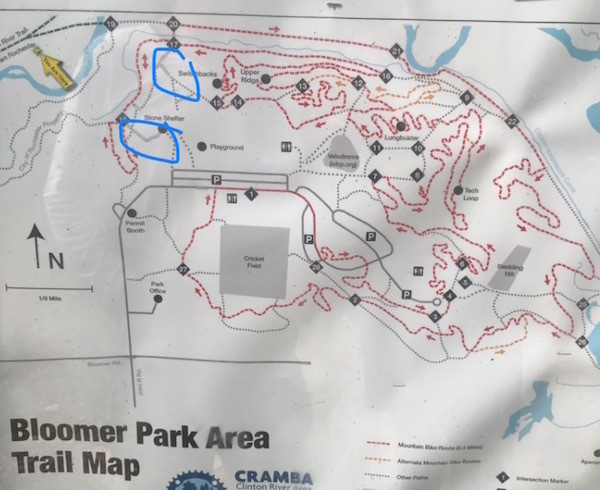 We also learned that, in the mid 1800s, there was a cockamamie plan to built a canal, over 200 miles long, across the entire state of Michigan. But money dried up pretty quickly, and construction stopped… in the Bloomer Park area. At one point we walked along a very old stone retaining wall that was likely remnants of that massive, failed construction project. We eventually did return to the second stairway for a final ascent. This stairway is taller – with 191 steps. And don’t forget about these! All told, we walked almost three miles and spent almost two hours on our journey. Not a bad outing at all! 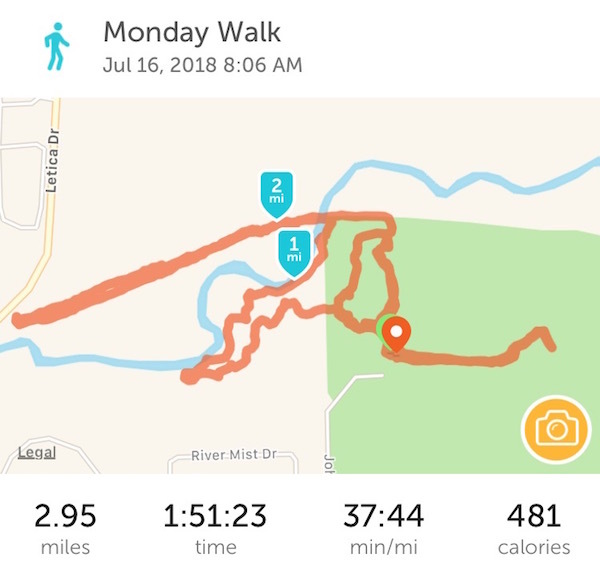 This entry was posted on Tuesday, July 24th, 2018 at 11:29 pm and is filed under Uncategorized. You can follow any responses to this entry through the RSS 2.0 feed. You can leave a response, or trackback from your own site. Wonderful trails. The stairs are epic. No risers though… Be very, very, careful if you ever run those, especially if tired. I’m glad your injury isn’t keeping you from walking. Thanks! Yup, the lack of risers definitely increases trip possibilities.